Hi all. The end of the year is approaching rapidly so it’s time to reflect on how IFICA has progressed over the course of past months and to take a peek at what’s planned for next year. Most importantly the Partnership has grown steadily and we now have really stunning organisations involved or interested in joining the IFICA network. The work program is taking shape and there are some great events that are planned for 2019. Over the course of the year there have been three Partners meetings. We have been able to link two of these, in March and November, to Workshops open to interested parties on topics relevant to Integrated Care that were held in the NSW Parliament House. Convened by Nick Goodwin and Viktoria Stein, they were well received and should become a familiar event on the IFICA calendar. 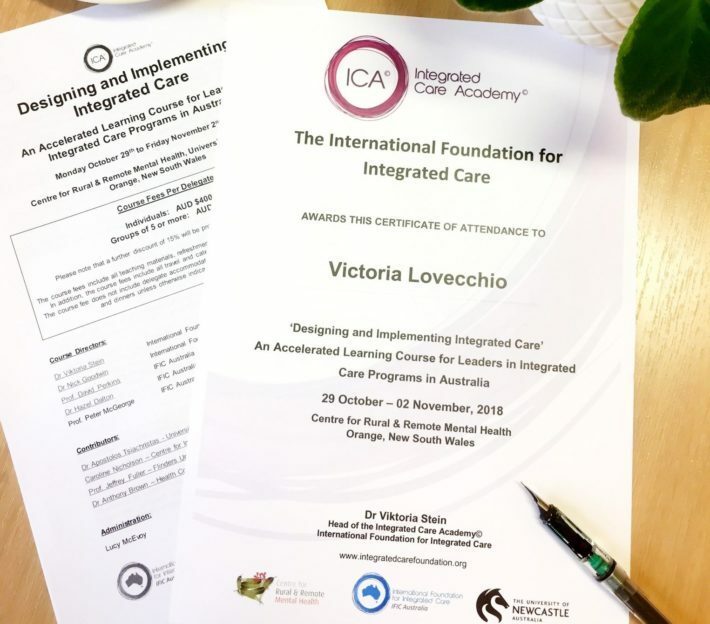 To advance knowledge of what’s happening in Australia, in terms of Integrated Care strategy and implementation, the Partners have produced case studies of the work they are doing with other organisations in their areas utilising a standardised template produced by IFICA. These are currently being organised into clusters of emerging themes and solutions that can be shared with the other IFICA Partners and written up in the International Journal of Integrated Care (IJIC). They may also serve as a basis for advocacy to highlight challenges and solutions for State and Federal Government agencies to advance the cause of integrated health and social care in Australia. There is also the Integrated Care Search database developed by IFIC up and running and open to members of IFIC to use. The IFICA case studies are likely to be added to this making the work done in Australia accessible nationally and internationally. Two “Accelerated Learning Programs” were held this year the most recent of which was in Orange. These workshops enable participants to consolidate their knowledge of the key components and implementation processes involved in the successful development of IC systems. They also provide an opportunity for participants to finesse their own IC projects including making presentations to an “expert” IFIC panel and receiving constructive feedback from the other participants in the process. In addition, several webinars have been sponsored by IFIC that Australians can access. These add to the array of opportunities partners and others have to increase their knowledge of Integrated Care. They are planned to continue next year. While a national conference was not held this year, another Asia-Pacific International Conference (APIC) is planned for November 2019 in Melbourne. Those attending the conference in 2017 will know what a great event it was. Be sure to keep an eye out for email alerts advising you of when abstracts can be submitted and details of the dates and venue. And don’t forget the 19th International Conference on Integrated Care will be held in San Sebastian in the Basque country 1-3 April. Again, a really great event with excellent papers and networking! That’s it for now. All the best for Xmas and the New Year to you and yours. Look forward to catching up in 2019. Chairman of IFIC Australia Professor Peter McGeorge introduces our inaugural newsletter which will be published quarterly and will keep members, partners and colleagues up to date on all our IFIC news. Prof Peter McGeorge is Chair of IFIC Australia and also Consultant Psychiatrist at the Universities of NSW and Notre Dame (Sydney) and St Vincent’s Health Network.